NEW YORK– A magical NCAA Tournament run that started in their home state will have the Gamecocks of South Carolina going to their first Final Four in program history. What South Carolina lacks in basketball history didn’t matter to this group of Gamecock players. Detemined to kick the door down of history, they dispatched Final Four perennial programs Duke, Wisconsin and Florida consecutively to acheive the historic feat that every South Carolina program stopped short of previously. Leading the Gamecock charge was regional MVP Sindarious Thornwell. The Southeastern Conference player of the year, Thornwell had 26 points in South Carolina’s victory. Thornwell’s dominance has given a national audience a chance to see the future NBA draft pick dominate the Gators defense. The Gators kept it competitve till the end as the school’s split home and home victories during the regular season. What sunk the Gators chances was poor three point shooting, the same thing that happened to them earlier this season in Columbia, S.C. when they shot 0-18 from the arc and lost 57-53. The Gators went frigid from the three point line in the second half Sunday and doomed their chances to extend their halftime lead. Florida shot an anemic 0-14 from the three point line in the second half. South Carolina capitalized on the Gators misfires from long range and muscled their way back into the lead. The Gamecocks scored 42 points in the paint, earning every basket as they thrilled the huge contingent of Gamecock fans that made Madison Square Garden sound like a football Saturday in Williams-Brice Stadium. The roof almost blew off the Garden as Duane Notice dunked with 11 seconds left to give the Gamecocks a 77-70 lead and send the program to Phoenix and the promised land of the Final Four. Don’t think for a second that the Gamecocks are satisfied with just making it to the Final Four. Thornwell doesn’t want to just settle for a quick cameo than bow out on Saturday. “Why not us? Why not go and win it all?”, Thornwell said rhetorically after the game. He has a point. This years tournament already has two programs making their first apperance (Gonzaga and South Carolina) and another (Oregon) that hasn’t been since 1938. 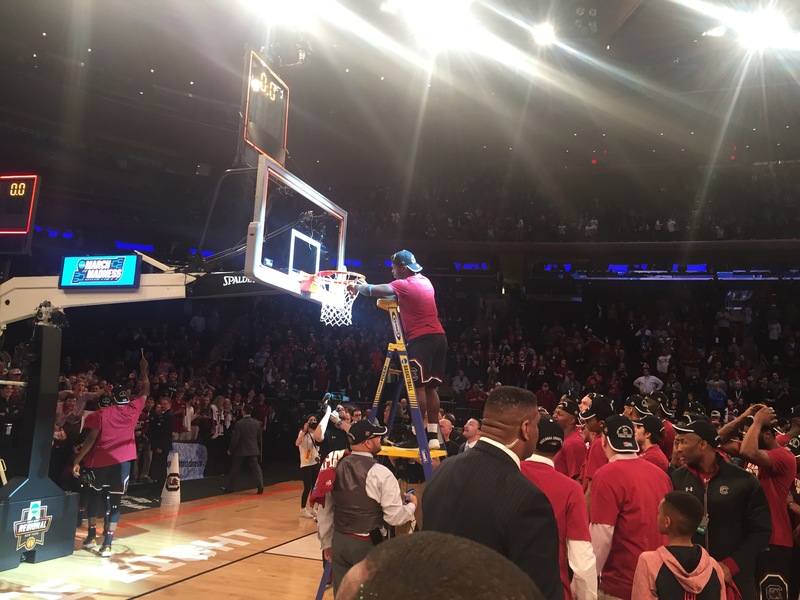 As South Carolina native and musician Darius Rucker wept at midcourt while watching his beloved Gamecocks cut down the nets the pride he had of the Palmetto State was apparent. From Greenville to the Big Apple, the Gamecocks are making themselves at home in the upper echelon of college basketball. Look out Phoenix, it’s about to get loud on Saturday. After all, this is an SEC team. Gamecocks fans are experts at making noise in a football stadium.